During a chat with Patrick Coote of Fraser Yachts, he mentions that the company's brokers seem to be making a specialty of selling both power and sail superyachts from New Zealand's Alloy Yachts yard, with four sold so far this year. Firstly there was the sale of the 39.8m superyacht Victoria of Strathearn followed by the 48.5m Georgia and 40m Allogante, and this week brought the news that Dennis Frederiksen had sold the 31.95m Happy Four. But there's still all to play for, as there are three Alloy yachts currently for sale on Fraser's books. 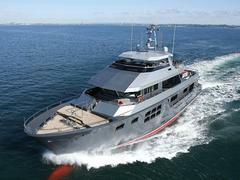 The 34.18m motoryacht VvS1 is listed at $14.5 million. Built in 2007 to Lloyds class and MCA compliant, she sleeps eight guests in a master, double and two twins. Then there's another motoryacht, the 38.6m S.Q.N. launched in 2003 and asking $10.9 million. Again built to Lloyds class, she accommodates up to nine guests in a master, two doubles and a twin plus a Pullman berth. Finally, a joint central with Dubois Yachts and a sailing yacht this time, is the 33.62m Imagine B. Delivered in 1993, she can sleep up to seven guests in a master, double and twin with Pullman, has never been chartered and is priced at €5.3 million.